The world of DIRECTV changed in the summer of 2006 when DIRECTV released its first HD DVR developed in-house. DIRECTV had used TiVo hardware and software, and for the most part people were happy, but there was a big learning curve if you were accustomed to DIRECTV’s regular receivers, which had all used the same software since 2003. DIRECTV cut its teeth on the R15 standard definition DVR, and although it wasn’t well received, they pressed on with the first product in a new generation of HD DVRs that are still being made to this day. The HR20 was an all new design from Pace that included a 320GB hard drive (huge for those days) and the ability to tune DIRECTV’s MPEG-4 signals (of which there were only a few local channels.) 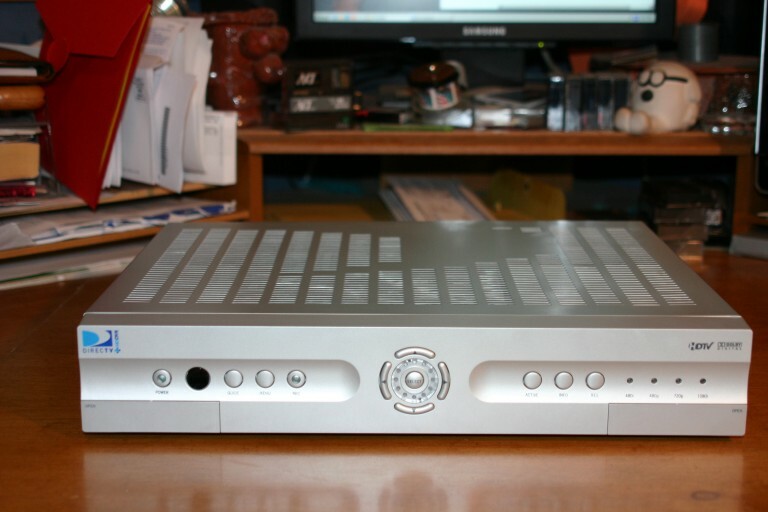 It included caller ID, the ability to set bookmarks, native resolution output and best of all from a DIRECTV perspective, it used the familiar menus now found on all receivers and the R15 DVR. It hit the market with a resounding thud. After initial enthusiasm died down, reality set in: making a DVR was obviously a little harder than anyone had thought. DIRECTV Engineers set out furiously fixing issues, often issuing more than one software patch a week or stopping a nationwide rollout because new bugs were found. The HR10 TiVo HD DVR grew in stature as the HR20 seemed destined to stumble. The release of a rare special edition in black did nothing to stop the criticism. The HR20 was king of the hill for a very short time; by 2007 there was a new model, the HR21. Aside from its silky piano black finish it acted just like the HR20 with one very important change: it no longer included the ability to tune over-the-air channels. It was not until 2008 when the AM21 antenna module brought this capability back, albeit at an increased price. Throughout 2006 and 2007, the DIRECTV faithful had a tough choice: soldier on with the HR10 which could not tune the increasing number of MPEG-4 HD channels, or accept the pitfalls of a still touchy HR20 or HR21. Luckily, the summer of 2007 seemed to bring a turning point to the DIRECTV HD DVR, as a succession of software releases brought not only new features but badly needed stability. It was a sigh of relief. DIRECTV continued to manufacture variants of the HR21 made by different manufacturers. The HR22 was an inline upgrade of the HR21 which used a larger, 500GB drive for 100 hours of HD recording but made no other changes to the hardware. The R22 was identical to the HR21 except for its flat-black case, but it was initially limited to SD tuning and recording only through a software switch. By 2010 however the R22 could convert to a full HD DVR if you had other HD hardware in the home. Perhaps the oddest duck of the HD DVR family was the HR23. It was intended as a replacement for the very first HR21s which were extremely expensive to make, and is alone in including wideband tuners that allow for MPEG-4 reception without special filters. This capability rapidly became unnecessary as DIRECTV rolled out SWM technology that made these wideband tuners a costly novelty. Sadly too, the emphasis on cost-cutting in the HR23 seems to have created a box that functioned far slower than the HR21 or HR22. By 2010, DIRECTV had long-since banished the early bugs of the HR20 platform and was free to focus on a next-generation DVR that could combine cost savings with increased power. The HR24 was a quantum leap forward in every possible way: it was smaller, faster, used a slick touch panel, and it was even quieter. It was greeted with acclaim by the DIRECTV faithful, who continue to request it to this day. HR24 DVRs didn’t give any more recording capacity, but their use of green-power drives and other tweaks allowed DIRECTV to tout it as the most energy-efficient DVR ever, a title it finally surrendered to a later DIRECTV DVR in 2013. The HR24 was so successful in fact, that it’s been DIRECTV’s longest-running DVR and shows no signs of retirement even though there has been another generation, which will be the subject of part three of our series.